The marvelous city of Granada is the capital of the province of Granada in the autonomous region of Andalusia and has about 240,000 inhabitants. The beautiful location at the foot of the "Sierra Nevada", the highest mountain massif in Spain, gives the city a special charm. 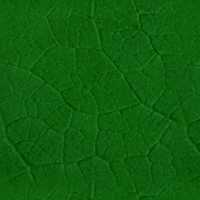 The city became renowned mainly for the spectacular remnants from its most remarkable history, which began with a Phoenician and Iberian settlement around 500 BC. After the reign of Romans, Vandals and Ostrogoths, Granada was conquered by Moors in 711and became part of the Emirate "Al-Andalus". In this way the city came under Arab rule for a period of nearly 800 years, in fact until 1492, when the last Emir surrendered to the Christian Spanish kings. 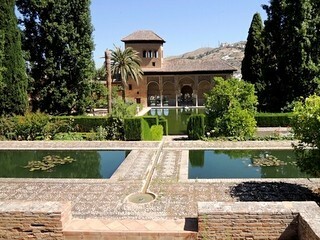 The greates sights is undoubtedly the fortress and palace complex on the Sabikah-hill, the Alhambra, one of the most visited tourist attractions in Europe! 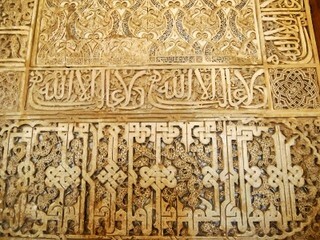 Twenty-three different Nasrid Emirs / Sultans had their residence here and ruled Granada from the founding of the dynasty in 1232 until 1492, making it one of the finest examples of Moorish style in Islamic art and giving a vivid idea of a royal Arab residences in the medieval period. 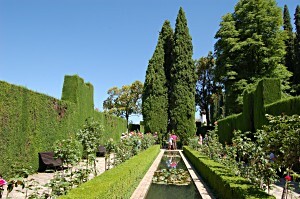 The Alhambra comprises Generalife, the rural residence of the Emirs outside the town walls, the medina, the Nasrid Palaces and the Alcazaba (citadel). 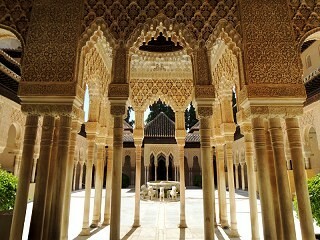 The Alhambra, Generalife and Albaicin, the old Moorish quarter of Granada, are UNESCO World Heritage Sites. A castle on this site was first mentioned in the 9th Century in connection with a civil war in 889. In the 11th Century, the site was expanded and developed into a fortress, but became a residence only in 1238, when Mohammed ibn Nasr, the first Nasrid ruler, founded the present Alhambra. 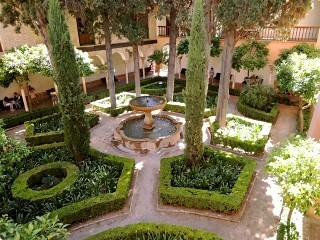 This marked the beginning of its heyday: The Alcazaba (citadel) was built and extended, the fortifications were reinforced, the water supply was secured and the magnificent Nasrid Palaces (Palacios Nazaries) with their charming gardens (eg El Partal) were created, mainly from 1333-1391. 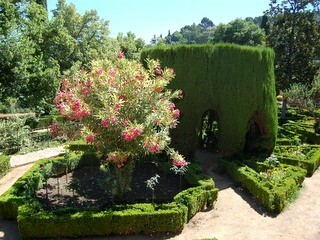 Generalife, the rural residence of the Emirs, was created in the 13th century and is a masterpiece of horticulture. 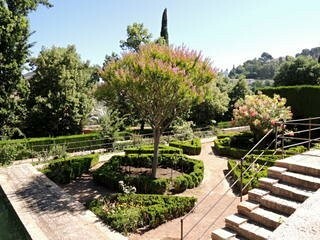 The romantic, subtropical gardens with exotic plants, arcades, flower beds, basins and fountains reflect the image of paradise. 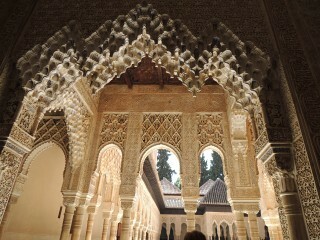 The Palace of Karl V in Renaissance style appears quite strange in this place, but after the reconquest the king wanted to benefit from all the modern achievements at the Alhambra. 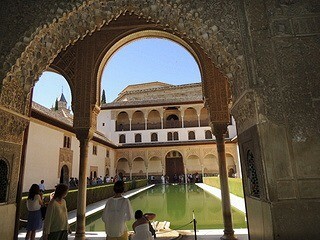 The palace was begun in 1527, but never finished as long as the king lived (only in 1957!) 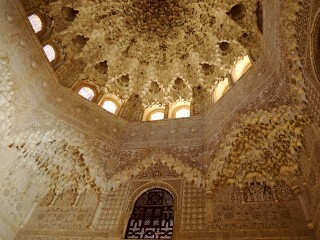 Unfortunately for this project parts of the Nasrid palaces were removed. Don't miss a walk through the historic Albaicin. The charming, well preserved, oldest quarter of Granada opposite the Alhambra is like a living picture book and gives vivid impressions of the city's Moorish past. When you follow the maze of small, slightly rising alleys, you'll reach the beautiful vantage point "Mirador de San Nicolas". at the Iglesia San Nicolás, where you can enjoy a grandiose view of the Alhambra and Generalife on the other side of the river valley before the background of the Sierra Nevada as well as of the city itself.